RUSH: Well, well, well. Found another myth, another Thanksgiving myth. Now, one of the things we always do here, by the way, is recite from one of the chapters in my second book, See, I Told You So, the real story of Thanksgiving. It’s become a tradition, and we usually do this in the last hour of the program.By the way, lots of people traveling today, it’s a worldwide record, it’s an all-time record, the number of people flying and driving, sailing, wherever they’re going, it’s an all-time record, despite the price of fuel, despite the price of airline tickets, despite the crowds and so forth, it is an all-time record, which is an indication that the economy is in good shape and that people want to go places and that they can. For this we should all be thankful. Now, for those of you driving, I am sure that many of you have little crumb crunchers in the car who may want to watch their videos in the back seats of the SUVs while you want to listen to this program. You will be totally proper and in line if you tell them to shut up while you listen to this program, and you might also suggest to the little tots that they listen as well. They’ll enjoy it, have an exposure to life that they haven’t had, probably. So just live it up. I know a lot of people are on the roads today and we’ll try to make your journey as pleasurable and quick as possible. Okay, one of the great myths of Thanksgiving is that we swindled the Indians when we bought Manhattan Island from them, we swindled them. Twenty-four bucks is the equivalent. It turns out, according to a book about Teddy Roosevelt, that that’s not true. It turns out that the Indians are the ones that ran the real estate scam when they sold Manhattan. 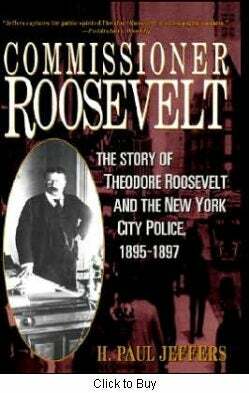 It’s a book on Teddy Roosevelt, Commissioner Roosevelt: The Story of Theodore Roosevelt and the New York City Police, 1895-1897, by H. Paul Jeffers. Here are the relevant paragraphs about this. ‘A persuasive case can be made that the city of New York began with a swindle. For generations school children have been taught that a slick trick was played on unsuspecting Indians by the director of the Dutch West India Company, Peter Minuit. In 1626 he purchased the island of ‘Manna-hatin’ for sixty gilders worth of trinkets, about twenty-four dollars. What Minuit did not know at the time, however, was that his masterful real estate deal had been struck with the Canarsie tribe, residents of Long Island; they held no title to the land they sold to the Dutch. In due course, the intruders from Amsterdam who thought they had pulled a sharp one on the locals were forced into negotiating a second, more costly deal with the true landlords of Manna-hatin,’ which is what it was called, Manna-hatin. At any rate, the original story of Thanksgiving is BS, we’ll set that straight later today, and now we find out that the Dutch got swindled. (laughing) The Indians can’t catch a break. Well, they are catching a break in Seattle. Don’t forget the story, the update we had earlier, that Thanksgiving is a time of mourning, as is being taught in public schools, because the Indians have nothing to give thanks for today, because they got swindled out of everything that was theirs, which is not true, at least as far as the original story of Thanksgiving.